This is the tale of two organizations with eerie similarities in how they evolved through the years. One is fictional, the other quite real. As far as we know, these similarities are not intentional, though this author believes in a Sovereign God – meaning there are no coincidences. Nobody knows for certain the origin of either organization. Both entities appeared in time and “history” was filled in after the fact to varying degrees. They gave rise to charismatic, authoritarian leaders whose power was rarely challenged. Each leader provides communications to the respective “collective”, insuring each “drone” has the official message, disregarding any information that may contradict it regardless of veracity. The first encounter locals had with either resulted in the same outcome: death or being assimilated. With each assimilation, the conquering organization was changed, having taken on various characteristics of the culture it conquered. As time went by, the original culture of each organization resulted in something that was not true to either their beginnings or the cultures from which they assimilated new converts. They each proclaimed that they, alone, represented the best hope for civilization – claiming to be the only legitimate culture into which all would be assimilated or disposed of. Each left a path of wreckage and death in their wake, blind to the needs of outsiders and blind to the errors of their ways and beliefs. 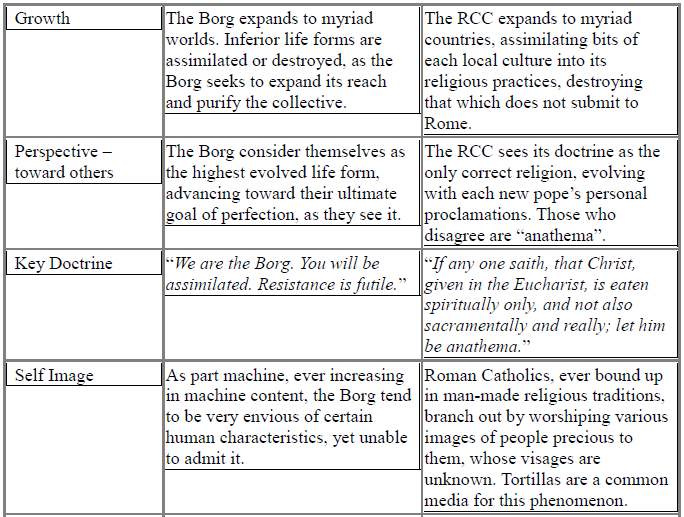 Here now, is a concise comparison between these two cultures. My goal is to make clear the old truism: truth is stranger than fiction. 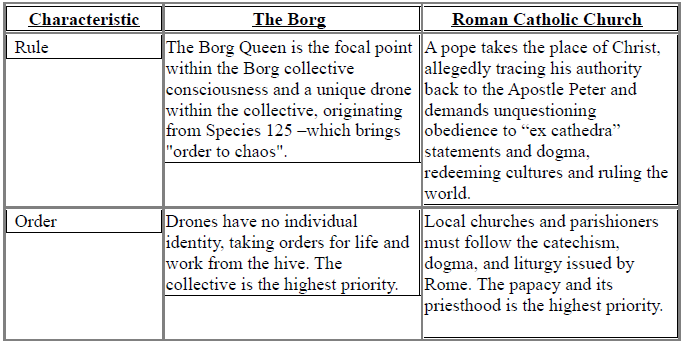 Note: No sources are listed, as fans of the Borg know their stuff and likely are not put off by this little article and Roman Catholics have their own sources and would not condescend to read anything I might suggest. So this document stands on its own, as my personal perspective, not needing to be defended against the Romans nor explained to the Reformed. 1. Both use an assumed identity. 2. Both costumes include headwear. 3. Both costumes include a cape. 4. Both assisted by young boys. 7. Both live in huge mansions. 8. Both have dark events in their pasts, which they would rather not discuss. 9. Both have an aging English butler, who’s been in the family for decades. 10. Batsignal in the sky over City Hall summons Batman. White smoke in the sky over the Vatican summons a new Pope. Let it be known that I do not hate Roman Catholics. I hate false doctrine that denies essential Christian Truths whether it is proclaimed by Catholics, Hindus, Episcopalians, Southern Baptists, or my own self. For this a Truth – God (by this I mean the Great I AM of the Bible) alone is without false ways. All blessing and glory and honor and power be unto the Lamb of God! Christ is risen – He has conquered sin and death and saved His chosen ones by His grace, lest anyone boast in the flesh. This entry was posted in Apostasy/Lukewarm, False Christs, Occult, Roman Catholicism and tagged Batman, Borg, papacy, Pope, satire. Bookmark the permalink. ← Lightning Strikes Car After Church Robbery? did you enjoy doing this? satire does have its place. in Psalm 2 the Lord is said to laugh at those who rebel against him – to have them in derision. I enjoyed reading this! And I too do NOT hate Catholics – I’m a former Catholic with Catholic friends and family. It is only grace that I was saved – that any of us are! To Him alone be the glory and honor and power and dominion forever and ever! Amen! I praise Him, for me and your former boss. It may sound silly but I believe He saved me because of His promise to be a Father to the fatherless. I was without my Dad – but I would rather that and know the Lord Jesus Christ! Yes, the deception is so sad, and once the Lord has given us life and eyes to see, it is so plain. What puzzles me is that many Christians today are not seeing this deception. They’re looking for some big end times guy! Thank you for responding – I really did enjoy this post. Though it’s humorous, I know you love the Lord and are serious in your concern for the lost. Manfred what an amusing think piece. Injecting Borg nanites into the blood stream of the non-Borg is like the Jesuits injecting heretical teachings into the protestant church. They injected arminianism, the root of all kinds of dangerous nonsense. They have injected the false missional social gospel movement into the protestants. 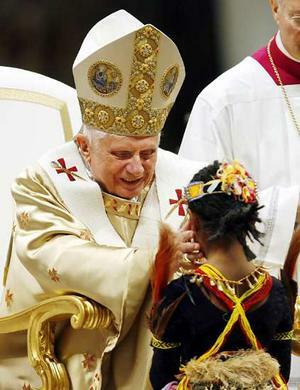 They have injected the Catholic Mystic Myth into the protestant churches. All of these work together to widen the narrow road and to diminish sound scriptural doctrine in favor of subjective feel good emotions. Rick Warren even says we need to move from doctrinal creeds to doing good deeds. These movements act as heretical yokes as dangerous bridge builders to draw protestants back to the “only true mother RCC church”. 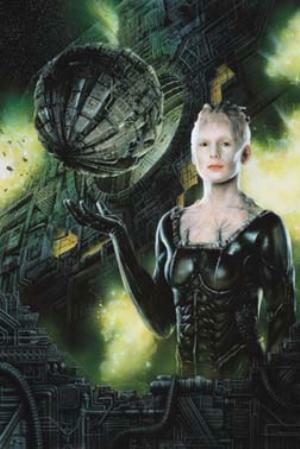 Come to think about it the Federation of Planets is as morally bankrupt as the Borg. It represents the modern liberal secular big government socialist movement with their ever evolving situational morals. What is the Prime Directive if not the post modern PC movement on steroids. may the Farce be far from you. Thanks for stopping by, T.I. Miller. You are right, my brother. The wide road leads to destruction as Rick and the pope and others skip along, thinking they are bringing people into the Kingdom of God. May He have mercy on those being deceived.